Dyspnea . . .perfect casual gear for lung exams, with built-in cotton wool. Nose hose snakes nicely through bodice area. Dyspnea is the medical term for laboured, gaspy breathing. It is the harrowing sensation of being starved of oxygen, which is why Dyspnea is also called ‘Air Hunger’. What a cool name for a clothing label! At least that’s what two young Perth designers have come up with—Dyspnea, for frocks that leave you gasping, I guess. Today’s SundayLife magazine covergirl, Sydney supermodel Emma Balfour, is shown wearing the $2000 Dyspnea gown for a breathlessly told story about how she’s making a comeback to the catwalk. 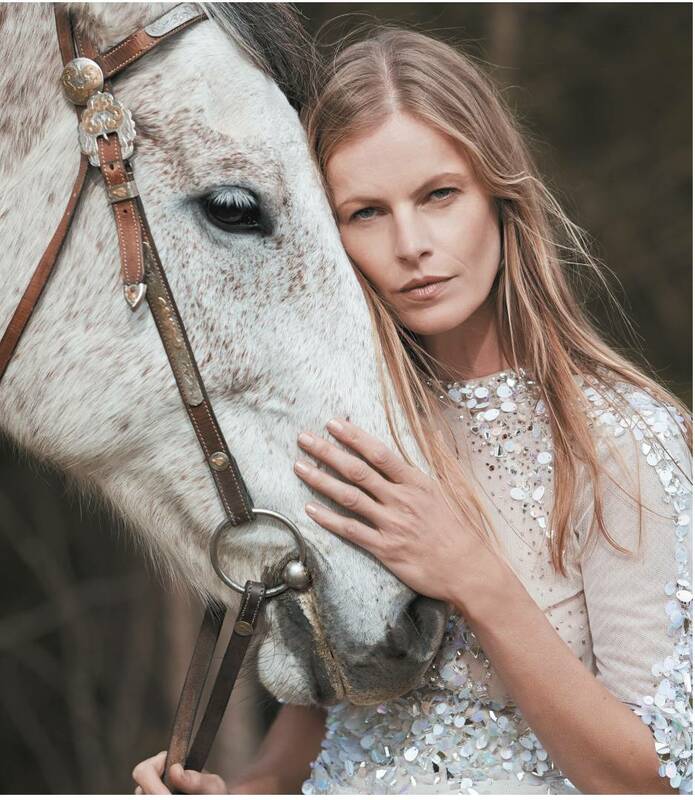 The supermodel is shown leaning on a horse—an animal which, spookily, can also develop emphysema. Why the long face Emma? (boom boom). Of course we all know that when you’re that puffy you’ll lean on any old thing to catch your breath. What next? Labels like Anorexia, Sarcoma, Leprosy or Melanoma? How cool. How about Tachycardia, for garments that make your heart race. The Dyspnea gown and Tachycardigan could work well together. Nice for those late night impromptu ER visits.
. . . Speechless. Over to you Weird Al with Word Crimes, just released. This entry was posted in Uncategorized and tagged anorexia, blog, COPD, Dyspnea, Emma Balfour, Emphysema, Fashion, fashion advertising, horse, nose hose, Oxygen, SundayLife magazine, supermodels, Weird Al Yankovic, Word Crimes. Bookmark the permalink. Bill, thanks. I had a bit of a laugh, which is sorely needed given the state of our world. The casual (and callous?) stupidity of these designers choosing such a name for their label left me breathless too Barb. Even if it seemed like a cute quirky name to them, didn’t anyone think to look it up in a dictionary? Biowoman are you serious? They called themselves Dyspnea (meaning difficulty breathing)… not Cancer or HIV??!! get a grip woman.